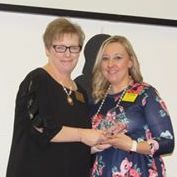 Ciara Crandall, The Clarion Inn, was presented with the Ambassador of the Year award at the 2018 Annual Banquet. Ciara went above and beyond the Ambassador expectations throughout the year helping the Chamber achieve its goals. She is shown here receiving the award from Chamber President, Myca Bunch.